Hope, aka Zam Hope, is a shiny black 2-year-old female, born on October 29, 2003. Hope's sire is Flying Penske and her dam is WZ Cupcake. Hope got her racing feet wet by starting her career at the Shoreline Star Greyhound Park in Bridgeport, CT. Winters get chilly in New England, so little Hope moved south to Texas to give the Valley Park and Corpus Christi tracks a few spins. Losing interest after 28 races, Hope decided that home life was more to her liking. 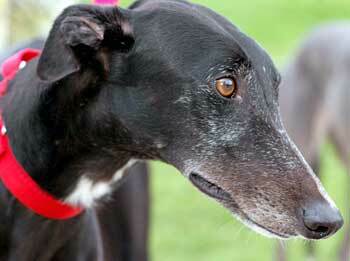 She is currently living in a foster home with two other greyhounds who are serving as her retirement mentors. A tad bashful upon arrival, Hope is quickly blossoming into a sweet and loving companion. 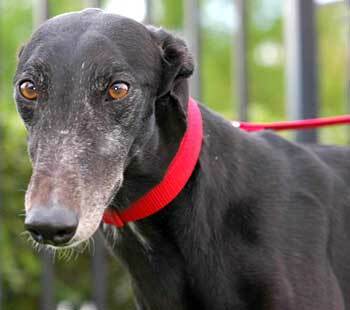 Hope is cat trainable but has not been tested with small dogs.